Visible City Research Associate and member of the L.O.T. Media Collective Anna Friz will perform at the Deep Wireless Festival of Radio & Transmission Art and give a presentation at the concurrent Radio Without Boundaries Conference. 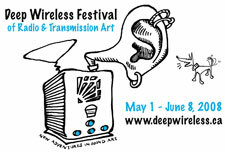 The Deep Wireless festival is a celebration of Radio Art produced by New Adventures in Sound Art that lasts the entire month of May each year and includes performances, radio broadcasts, commissions with CBC radio's "Outfront", a CD, installations, workshops and a conference. It runs from May 1 - June 8, 2008. Kathleen Kajioka, Andreas Kahre, Chantal Dumas and Debashis Sinha bring together their diverse experiences to create new and exciting collaborative performances in a series of Sonic Portraits. Also included are multi-channel performances of CBC outfront commissions by artists Marjorie Chan, Richard Marsella, Eldad Tsabury and Tristan Whistan. Portraits in Sound 1 will be followed by a rare performance of "Somewhere a Voice is Calling" - Inspired by the history of Reginald Fessenden's voice on radio and the "secrets" of radiation, Absolute Value of Noise, Anna Friz and Glenn Gear will draw from tales of ghost ships and myths from the early days of radio to create a performance that conjures an ethereal world of distant voices, sea, and static. Radiomaker Gregory Whitehead posits that artistic appropriations of radio "involve staging an intricate game of position, a game that unfolds among far-flung bodies, for the most part unknown to each other." Mobile and micro-radio art practices bring these formerly far-flung bodies into contact and context and allow for something unexpected to happen. This presentation explores the relations of proximity, distance, interference, and feedback invoked when radio is no longer defined in terms of senders and receivers, but operates as an instrument. Here the concept of transception (the ability to both send and receive) is realized as a musical relationship in a circuit of devices and bodies, near and far. Beginning with the Theremin, an instrument with which sound is created through the interaction of two radio frequency oscillators and the human body, I will consider contemporary radio practices that employ low- and micro-watt transmitters, receivers, and bodies to create sonic installation and performance works characterized by dynamic radiophonic feedback.